With its new collection, appropriately titled Cheap Engagement Rings, customers do not need to spend three month salary for their purchase on diamond rings and wedding ring sets. 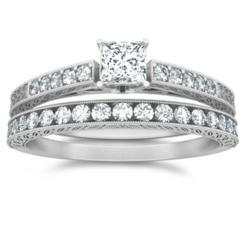 Customers can find affordable engagement rings and wedding sets starting from only $299 onward. Gone are the days where the 3 month salary rule applied. JewelOcean.com has launched a brand new collection of diamond rings and wedding ring sets, titled Cheap Engagement Rings, which as the name suggest, intends to save potential customers hundreds of dollars over their next wedding set purchase. Cheap engagement rings are affordable, with prices starting from only $299 onwards yet provide beautiful designed engagement rings and wedding ring sets with either princess cut or round cut diamond, set in either 10k, 14k White Gold or 18k White or Yellow Gold. “Gone are the days where the 3 month salary rule is applied,” says Mathew Bruno, manager at JewelOcean.com. With the economy still reeling and unemployment rates staying high, love does not have to take a backseat. With the Cheap Engagement Rings collection, JewelOcean.com intends to bring love back into the lives of its customers. These affordable engagement rings features very unique designs, from classic princess cut solitaire engagement ring designs, antique engagement rings to more contemporary wedding ring sets. A customer can find a 1 carat total weight wedding ring set, set on 10k white gold for only $799 under the new Cheap Engagement Rings section, featured on JewelOcean. Customers looking to get a certified diamond would also be pleased to see that most diamond engagement rings and wedding sets can be customized with a Gia certified princess cut diamond or round cut diamond. Customers have the option to select their choice of center diamond weights, ranging from 1/3 carat, ½ carat, ¾ carat or even 1 carat sizes. Inexpensive engagement rings are not only affordable, but they are made with dedicated craftsmanship and care, so the customers would still get high quality diamond rings at only fraction of the regular Jewelry store prices. Plus military servicemen can save even more by utilizing the JewelOcean military discounts on engagement rings and wedding sets. JewelOcean.com is a leading provider of wedding ring sets and diamond rings, providing them at affordable and cheap prices for over 10 years. All diamond engagement rings purchased come with their guarantee certificate, refund policy and free shipping. By providing customized engagement rings options, see how JewelOcean.com can save hundreds of dollars on the next purchase, please visit http://www.JewelOcean.com.